New Mexico Gov. 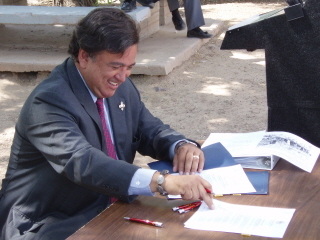 Bill Richardson (D) Monday signed into law a bill making the state the 12th to approve the medicinal use of marijuana. Richardson is a candidate for the Democratic Party 2008 presidential nomination. In signing the bill, he becomes the only major contender in either party to publicly endorse the medicinal use of marijuana. The Lynn and Erin Compassionate Use Act, named after patients Lynn Pierson and Erin Armstrong, allows people who live with certain serious, chronic conditions to use and possess marijuana with a doctor's recommendation. But in a departure from the normal practice in other states, where patients or designated caregivers are allowed to grow their own medicine, the New Mexico law stipulates that only producers licensed by the state Health Department may grow medical marijuana. The bill came only after being denied House floor votes in two previous sessions and after apparently being defeated this session. But thanks to strong lobbying by Richardson and groups like the Drug Policy Alliance New Mexico office, it passed on a second, last-minute vote. "This law will provide much-needed relief for New Mexicans suffering from debilitating diseases," said Gov.Richardson in a signing statement. "It is the right thing to do. I'm proud to sign legislation that makes patient care an important priority in this state," Richardson said. "It is time for Congress and the federal government to follow our lead and help those forced to endure painful, chronic diseases." "By signing this bill, Gov. Richardson is showing his compassion for seriously ill people, and he is also reflecting the will of the majority of New Mexicans and the American people," said Reena Szczepanski, director of the Drug Policy Alliance New Mexico in a Monday statement. "I hope that other elected officials take note: Americans will stand behind those that believe in compassion and mercy for our most vulnerable, our sick and dying patients struggling for relief." New Mexico now joins Alaska, Arizona, California, Colorado, Hawaii, Maine, Montana, Nevada, Oregon, Vermont and Washington as states that have approved medical marijuana. We need more politicians willing to stand up and understand that compassionn is more important than keeping with the old ways of misunderstanding and predjudice. Marijuana has been kept illegal for far to long and for one simple reason. That reason being it can not be patented by the large pharamacuetical companies. Unlike the key ingredient in Marijuana ( T.H.C. ) which has many accepted uses including depression, from which I suffer. Now can anyone who uses their brain tell me why Marijuana is a schedule 1 drug (meaning that is has no accepted medicinal value) yet Marinol a patented copy with a cost of well over $1000 a month is a schedule 3 drug. To me the answer is easy 1.your average individual could produce their own medicine if this safe and effective natural herb were legal, 2.our jail system would be empty leaving the correctional industry with a large problem. The problem is there aren't that many babysitting jobs available that pay $20 or more an hour! I live in California where the top two donators of political funding are the Pharmacuetical industry and The Correctional officers Assc. Whether you use Marijuana ,know, someone,or don't have any experience with it at all, If you take the time to study the facts from around the world and investigate the lies and propaganda that our Government has used to keep Marijuana from completing its God given uses for healing you will be amazed and convinced about the miricles our Government has blatently hidden from our great nation of people. "New Mexico now joins Alaska, Arizona, California, Colorado, Hawaii, Maine, Montana, Nevada, Oregon, Vermont and Washington as states that have approved medical marijuana." I've been smoking now for most of my life, half of my life daily, and I'll stack my health and overall functioning over anyone. I don't smoke as much now as I used to, (but if I could I would) but in my heyday, I smoked about as much as one could humanly smoke, and it STILL never kept me from doing anything I set out to do. Since I started smoking pot, I've acquired two degrees and started two careers, competed athletically, volunteered, won awards in art, bought a house, travelled, you name it. I don't regret smoking one bit, and I don't consider it abusable. I left NM last year for CA, and I applied for medmar status a few months back. I've been using it for my arthritis since, and have these results to post. First, the arthritis appears to be reversing. Second, I think I had some other undiagnosed auto-immune disorders (actually, I think they were mis-diagnosed, but that's another story), they are all clearing up as well. Third (the weirdest thing), although I am smoking pretty constantly now, I don't really get 'stoned' anymore. All in all, I consider it a successful experiement. I would heartily recommend this medicine to almost anyone. I urge Governor Bill Richardson to call my Governor Tim Pawlenty of MN and explain to him why he should support mmj legislation being considered in the state of Minnesota. The medical marijuana movement is another excuse for the criminals of USA government to steal from the poor. It should just be sold as in Amsterdam and with people allowed to grow at will up to 10000 plants for personal use or for free giveaway to adults. The regime in power is laundering drug profits in USA banks who are given charters by the criminals in the FDIC and Treasury. I hope if the regime is not destroyed that a global war erupts so we can kill our enemies in power. Never again serve, and if they inject you, kill them. If you use marijuana at over $5 an ounce, you are being USED. Never again serve and applaud when the regime is tackled by the throat. As the father of a young lady, I have seen her experiment with both alcohol and Marijuana. I advocate neither for use as recreation but I have four friends with cancer who will all testify to the fact the med helps them tolerate the chemo better, it relaxes them, it is synergistic with their meds so they do not have to take so much. Plus they are able to eat. I see nothing that causes me to reject this alternative to pills that causes alarm for me. On the othe hand while drinking, my daughter was picked up for DUI, lost her job, and now is facing serious jail time. So I say if anything lets take a good long look at why alcohol is so acceptable and MJ is not. Its about time! the only reason canibus was outlawed was because of crooked politicians and some major corperations that didn't want to compete with all the benefits the canibus could provide they started their fraud of the plant in the 30's with the numberous prapaganda claiming it was a drug that made users violent...fact of the matter..people were growing the plant for rope and clothing and medical purposes for centuries ...they even were using hemp seed oil to burn in the oil lamps they used...the history channel has several series about drugs and how they became illegal and marijuana was one of them the history channel is the only one out there along with some indy potumentaries that bring you the facts and truth ....it is time for a change the goverment rather you be hooked on THEIR drugs...ones that people overdose and die on or cause worse side effects or even the same symptom that they are trying to help on top of that some of those drugs will do more damage to your body than the disease you are trying to treat !...there has NEVER been a marijuana overdose but you can die from alcohol via drunk driving or drinking too much. Think about this....if America were to start growing marijuana crops for rope ...fuel...clothes...medicine whatever else they can think of...government would be able to tax it export it in other words money for our dropping dollar maybe even new jobs more jobs...it is something that may actually help us get it together finally...lets hope that these crooked politicians get their heads out of their butts and use their common sense for once ...after all they should see dollar signs when discussing this topic...for those of you who believe the prapaganda that has been handed down from the 1930's ...i encourage you to get educated on the subject instead of taking the lying governments word for it....if you want to get technical...nicotine and alcohol are the gateway drugs ....i have been using marijuana for over 15 years for my back problems and depression ...i have been neither violent ...overdosed...or moved on to harder drugs...the worst that has happened to me is i gained 5 lbs! and i have RELIEF.....so all you anti-pot nazis need to get the real facts instead of spewing ignorance...and hey while u are at it smoke one maybe that will chill you out!!! Anyone know of a Dr. with the kahunas to write referrals in N.M., I moving there soon and also heard dispensaries is a problem. True? Please, come forward. We need your help. provide you with two doctors if you go in with Chronic Pain as your diagnosis. Hope this helps. NM MM Law a Joke! The medical marijuana (MM) program in New Mexico is a bit of a joke. 1. Trying to find a compassionate doctor is a near impossibility. So far we can't find one. 2. The Lynn and Erin Compassionate Use Act was passed to mostly favor them and a MM clinic they were starting up, and the situation pretty much remains the same at this time. The production level of the MM producers is not even close to being able to keep up with the demand. 3. Free Enterprise as far as producing MM goes was severely stifled/restricted by the state to make sure it was controlled for the benefit of Lynn and Erin. Politics at the dirtiest level. 4. The state had a requirement in early 2009, a requirement that has since mysteriously disappeared, requiring a prospective MM producer to prove they could grow the different types of medical marijuana needed for patients, without any protection from the law, which meant you could be busted and prosecuted for growing the medical marijuana required to prove you knew what you were doing when it came to growing. We were caught up in such a situation and are now spending what little money we have left to keep my wife and son out of prison. The state chose not to prosecute me, a 62 year old vet with cancer, chronic pain, and a host of other military caused medical problems; rather they chose to arrest my wife and son and prosecute them; go and figure that one out. With the combined experience and education possessed by us as far as marijuana, agriculture and botany goes, hands down, we can outgrow and outproduce the current growers in our state, and produce a much better chemical free product. 5. The only way medical marijuana will ever truly work in New Mexico, is when it is legalized to the point that allows free enterprise, and the genius of those who can grow it without fear of going to prison, which is currently not the situation in New Mexico. 6. The medical marijuana program in New Mexico is broken!